cards, a cell phone and $2,450 in cash. The crime occurred at 3:20 p.m. Wednesday, April 30. The robbers entered and immediately pepper-sprayed two of the four employees on duty (the owner, a 44-year-old Justice man, and three sales staff—a 39-year-old Darien man, a 32-year-old Berwyn man, and a 19-year-old Garfield Ridge woman). One of the robbers pulled a chrome-plated handgun and ordered the employees to lie on the floor, according to police. The robbers then ordered the owner to open the store’s safe. When he had difficulty seeing the numbers because he had been pepper-sprayed in the eyes, one of the robbers hit him in the head with the gun, knocking him out for a few minutes, according to police. The four men then rifled through the victims’ pockets and purse. The owner regained consciousness and was hit again in the head. The robbers then fled, speeding away north on Harlem in a dark blue, four-door Chevy Cruze with Missouri license plates. Police described the owner’s wounds as a “major injury” to the top and back of his head. The man declined a CFD ambulance ride, police said, explaining that his wife would take him to the hospital. The four criminals are described as black men age 20-25, 5’8 and 170, short black hair, wearing dark baseball caps and hoodies. A thug entered Pete’s Fresh Market, 4700 S. Kedzie, pushed aside a cashier (a 16-year-old Gage Park girl) in the middle of a transaction, and stole $750 cash. The crime occurred at 6:40 p.m. Thursday, May 1. The manager, a 41-year-old Garfield Ridge man, provided police with surveillance video to review. The robber is described as a white Hispanic man age 18-21, 6’0 to 6’1 and 155-165 pounds, medium complexion, wearing a black baseball cap, black/red bandanna and a gray hoodie. 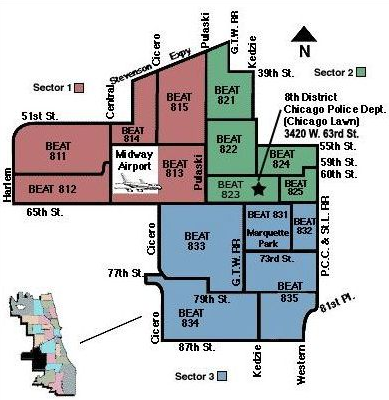 live in Beat 815 or 821 (see map), come to St. Bruno School (south entrance) at 7:00 p.m. Wednesday, May 7. Hear updates on crime in your neighborhood and learn how you can work with neighbors and police to make the community safer and better for all. A 38-year-old West Elsdon woman who decided not to respond to a knock at the front door of her home near 56th Place and Hamlin, minutes later heard burglars kicking in her back door. She fled out the front door, and the burglars stole a laptop computer and assorted jewelry. The crime occurred at 2:04 p.m. Wednesday, April 30. The two burglars are described only as white Hispanic men age 18-21, 5’8. Burglars entered the back window of a home near 68th and Komensky and stole a TV, a desktop computer, a cell phone, three video game consoles and assorted video games, several purses, assorted jewelry, several crystal angels and two motorized scooters. The crime was discovered by the victim, a 38-year-old woman, when she returned home from work at 3:15 p.m. Monday, April 28. Burglars forced open the back door of a home near 52nd and Lavergne and stole a tablet computer, two watches, assorted jewelry and about $2,000 cash. The crime was discovered by the victim, a 32-year-old man, at 1:30 a.m. Thursday, May 1. Burglars kicked in the side door of a home near 59th and Natoma and stole $4,000 worth of gold chains and necklaces. The crime was discovered by the victim, a 46-year-old man, when he came home from church at 4:40 p.m. Saturday, May 3. Burglars entered a home near 78th and Keating and stole two checkbooks. The crime was discovered by the victim, a 65-year-old woman, when she came home from shopping at 8:15 p.m. Thursday, May 1. Police said they saw no sign of forced entry.